Bifurcated SF action thriller that starts off all “Logan’s Run” before getting a painful stitch. Ewan McGregor and Scarlett Johanssen inhabit a future (because it’s shiny and glass) city that’s home to the survivors of a worldwide contamination. The weekly lottery show plucks a citizen to leave the city and head to The Island, a safe outside place where civilization will begin again. But Lincoln Six Echo (McGregor) isn’t so sure. He starting to ask a few questions about what’s really going on. 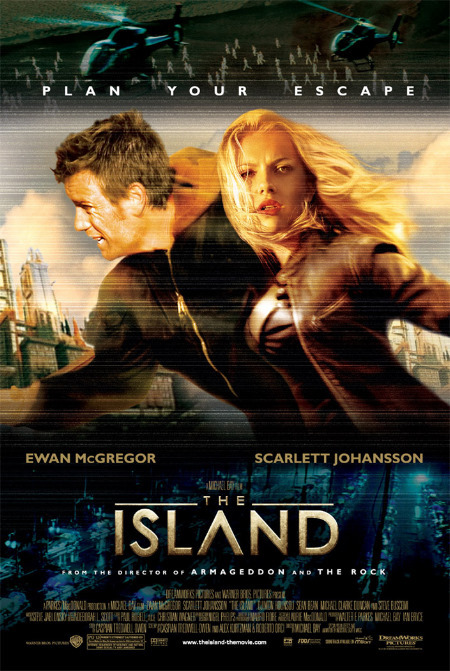 When Jordan Two Delta (Johanssen, dressed in tight clothing like an upmarket version of her namesake and Britain’s favourite trash model) is picked to go to The Island, Lincoln discovers the truth and saves her from her terrible fate. Both of them escape the city and go on the run to learn the terrible truth. Who would’ve guessed that behind the shiny, stainless steel facade of future world there was a sinister conspiracy? Most of us, of course, because we have all seen these films before – “Logan’s Run” and “THX 1138” spring to mind, heck, even Lang’s “Metropolis” – and while “The Island” ‘s Wikipedia entry , claims it’s actually a pastiche of those and other films, you can’t help thinking some DVD salesman added that after the fact trying to retro-fit a well-used idea for today’s gullible audience. It’s an awkward film to watch, embarrassing in the first half with its laboured, SF cliches – a utopia that’s actually a dystopia, daft code names instead of real names, white outfits (and Puma trainers, no less), black-suited guards who stop any jiggy going on. By the second part, it’s just beer-time as director Michael Bay shifts gear from conspiracy-light posturing to his trademark OTT action scenes where you can’t stop thinking of the ridiculous fuel budget for the at least 2 million helicopters he employed in endless, dizzying aerial fly-bys. Set-pieces consist of the usual pole-vaulting cars and trucks, grim-faced and bearded henchmen, and sadly not enough of the jet bikes which only get a brief, budget-sapping SFX appearance. Neither half of this movie really outshines the other, and only Djimon Hounsou as a mercenary hired to track down the fugitives comes out of the whole affair with any kind of thespian credibility. To sum up with the customary cheesy gag, “The Island” is all at sea. And that joke is better than the film.